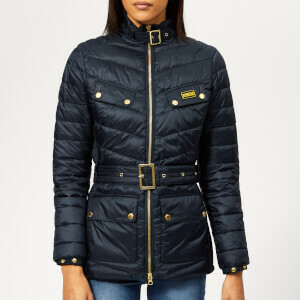 Padded black jacket from Barbour International. Crafted with an ultra-lightweight fabric, the ‘Durant’ coat features chevron quilting and a synthetic down fill for ultimate warmth. Fastening with a two-way zipper, the jacket uses a drawstring hood and adjustable cuffs to protect against the cold, while outer and inner zipped pockets provide secure storage. Gold tone hardware and a rubber logo badge add the finishing touches to the design. Main/Lining: 100% Polyamide. Fill: 100% Polyester.